Mexican American Unity Council, Inc.
Walsh Gallegos Trevino Russo & Kyle, P.C. 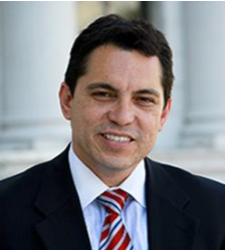 David Hinojosa is a national leading litigator and advocate in the area of civil rights, specializing in educational civil rights impact litigation and policy. In January 2019, David joined the esteemed, wellregarded education law firm of Walsh Gallegos, P.C., and will be serving school districts out of their Albuquerque, NM office. As IDRA’s first and former National Director of Policy, he spearheaded national policy reform efforts impacting the education of underserved students of color, low-income, English learner and recent immigrant populations. David also directed IDRA’s regional equity center where he and his team provided technical assistance to schools across the American South, helping them to break down civil rights barriers to equitable treatment and educational opportunity. Prior to joining IDRA, Mr. Hinojosa served twelve years as staff attorney, senior litigator and Southwest Regional Counsel for the Mexican American Legal Defense and Educational Fund (MALDEF), the nation’s premier Latino civil rights law firm. Mr. Hinojosa’s cutting-edge litigation and policy work resulted in breaking down segregated schools, improving state school finance systems, cultivating quality programs for English learners, preserving access to higher education for underserved students and military veterans, ensuring equal employment opportunity and securing driver’s licenses for immigrants. David has also published several book chapters, journal articles, newsletters and op-eds on educational opportunity policy and litigation, including “Rodriguez vs. San Antonio Independent School District, Forty Years and Counting” published by the Harvard Education Press in The Enduring Legacy of Rodriguez (2015). A proud graduate of Edgewood High School (c/o ’88), David served nearly eight years in the U.S. Air Force. He earned his bachelor’s degree from New Mexico State University in 1997 and his juris doctorate from the University of Texas at Austin School of Law in 2000. MAUC was incorporated in 1967 as a means to diligently organize for economic and political empowerment of the Mexican American population in San Antonio. 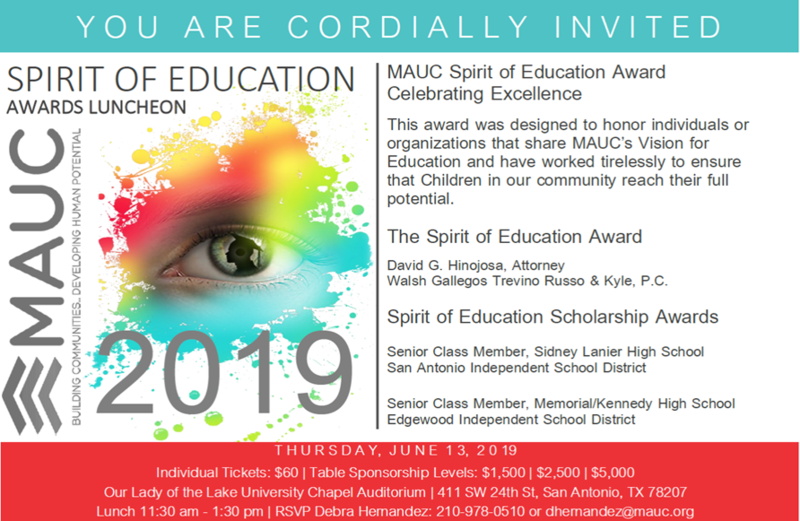 MAUC continues to seek ways to build the organization’s effectiveness and sustainability in the delivery of social services in the area of education, health, family strengthening and community economic development to all areas of the City and County.